Venkatesh is one of the star heroes who has got a high success ratio among his counterparts. This year, he started on a good note with the success of ‘Seethamma Vakitlo Sirimalle Chettu’. Venkatesh is hoping to end the year on a good note too and is getting ready with the release of his upcoming film ‘Masala’ on 14th of November. Ironically, this film is a multi-starrer too with Ram in the other lead role. Venkatesh seems to be the favourite choice of directors and producers for multi starrers, as he has signed his next film with Ram Charan in the direction of Krishna Vamsi. 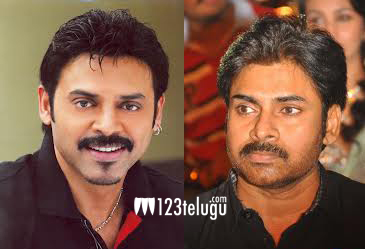 In an exclusive interview with Telugu daily Eenadu, Venkatesh has confirmed that he is surely going to act with Pawan Kalyan in the future. Speaking on the Daggubati’s family film, he said that he has heard three stories already, but was not satisfied with those stories and is waiting for the right script to kick start the project.